The RIPE Roadmap invests in climate mitigation, water quality improvements, water conservation, fertilizer reduction, and soil health — all in one bipartisan policy. Robust climate policy needs bipartisan legislative support that creates stability for long-term investments in clean energy. The climate policies that have passed so far, in the few states outside of California, have not gained the political will needed to get the pollution fee to be robust enough to actually impact the energy companies’ behavior. The policies that result are ‘non-binding’ and are not effective in changing the market to more clean energy. To achieve the levels of greenhouse gas reductions that scientists say are necessary, there needs to be bipartisan support and rural constituency support for increasing the pollution payment to the price that is economically efficient. Agriculture uses approximately 80% of all U.S. water and is a leading source of water contamination. There are many reasons for this, and we all eat the food grown by this important sector, so we all bear responsibility for improving its impact on our shared resources. Investing in farmers will help us improve our stewardship of our shared water, soil, and air. An ecosystem value framework is more valuable to society than a cost-sharing framework. There are government programs that fund farmers to do sustainable agriculture practices, but they are based on paying only a portion of the cost that farmers must pay to do them, and there are strict caps on the amount of funds each farmer can receive. This is largely why only 6% of farmers participate in those programs. The RIPE Roadmap shifts the view away from a partial cost-share and towards an ecosystem service value that offers farmers compensation that is equivalent to the much higher value to society that these sustainable agriculture measures provide society. As illustrated in the chart below, the value to the environment and society from one acre that is sustainably farmed is significant, and the RIPE Roadmap offers to compensate farmers to invest in these attributes that are so valuable to society. 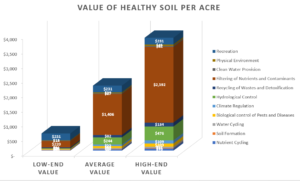 A review of soil ecosystem service studies finds that healthy soil, which would be achieved through qualifying measures such as rotational grazing and conservation tillage, have a societal value of $588/acre on the low-end, $2,230/acre as the median, and $3,870/acre in the high-end. (Classification and valuation of soil ecosystem services, Agricultural Systems, June 2016). The RIPE Roadmap offers compensation in the $50-$230/acre range, which gets us closer to the real societal value worthy of our investment.